Anglers are encouraged to follow the action and share their experiences on the departments Angler's Log, a public information sharing board. Put-and-take areas have a five-trout limit and specific spring closures depending on location. Closure 1 runs on specified waters from the first Sunday after March 4 to the last Saturday in March. Closure 2 applies to specified​ waters from Sunday to Saturday of the last full week of March. Consult the Maryland Guide to Fishing and Crabbing for closure dates and special management area restrictions. The daily limit (in areas that are not put-and-take or special management areas) is two trout with no minimum size and no closed season, except in special trout management and put-and-take areas. Please clean and dry your gear between streams and outings to prevent the spread of harmful invaders such as didymo and whirling disease. This can be done by washing waders, boots and other items with dish soap or a five percent salt solution, or at wader wash stations located at the popular access points. Anglers who catch and register a trout that meets or exceeds the Angler Award minimum sizes ─ 20 inches for a Rainbow and 21 inches for a Brown ─ will earn an Angler Award certificate, the Angler Award program has a long history and includes 60 State wide. As the title implies, these locations are restricted to catch and release fishing only up until a specific date. 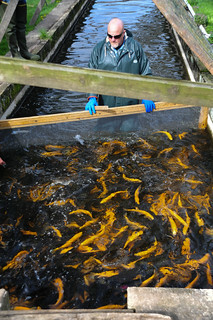 Delaying harvest offers several benefits to anglers, including a larger number of fish to be caught, and these longer term acclimated fish exhibit a more natural trout feeding behavior, allowing fly fishermen to have additional opportunities to test their skills matching hatches on the streams with delayed harvest regulations. 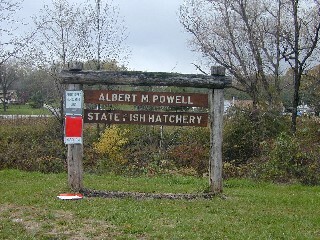 In contrast, most put and take streams are "fished down" after several days and the fish that are stocked are often geared toward feeding on pellet food from the hatcheries. Multiple stockings of delayed harvest areas offer trout fishermen a higher success rate over a longer period of time, with the bonus of providing a late spring or early summer five fish creel limit long after most of the put and trout streams have seen peak catches of trout. There are two distinct groups of designated Delayed Harvest Trout Fishing Areas​. The department is asking anglers to continue to be vigilant about not spreading whirling, other disease and invasive organisms. Please remember to clean your gear between streams or outings to prevent moving around unwanted invaders like didymo and whirling disease. You can wash with dish soap or a 5% salt solution or use one of the convenient wader wash stations if present at your location. For information on how you can help, look below this article and go to Additional Disinfection Methods for Fishing Gear. A detailed synopsis of our 2007 whirling disease testing results and related information is now available at this site. For more information go to The Whirling Disesase Update Page. An invasive and potentially detrimental algae known as Didymo (Didymosphniageminata) has been identified in the Gunpowder River below Prettyboy Dam. This algae, also known as 'rock snot', can have negative impacts on stream biota such as aquatic insects. It can also hinder reproduction of trout and other fish species. Anglers and boaters are asked to take the same precautions that were suggested for containing whirling disease and other invasive species. Currently raises a majority of the fish for Maryland's freshwater trout fishery, check out the hatchery through their web page. The departments trout stocking program is funded entirely by the sale of nontidal fishing licenses, trout stamps and Federal Sportfish Restoration Program (Wallop-Breaux) funds which are generated by a special excise tax on boating and angling equipment.